When decorating their patio, most people want to bring all the comfort and style from their indoor to their outdoor space. If that’s the case with you as well, you should definitely invest in durable pieces of furniture that can withstand the elements. My suggestion? Teak. It is certainly one of the most strong and eye-appealing materials used for outdoor furniture, able to withstand extremes of cold and heat without losing any of its quality. Its grain and colour make it one of the most attractive materials for the making of chairs, tables, benches, and sun loungers that can easily complement any design scheme. Once you invest in teak, you need to make sure that it stays clean and well-kept to make the most out of it. 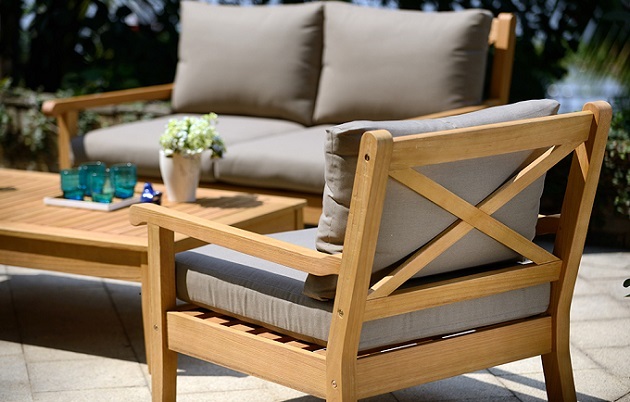 Generally, teak outdoor furniture care does not involve many arduous cleaning tasks – in most cases, hosing it off is enough to keep it dirt- and dust-free. If sometimes this does not work, warm water, middle soap, and a soft sponge will certainly do the job. Doing this once a week is usually enough to keep your furniture clean, but this still depends on the climate of your area and the amount of dirt your furniture collects. Although teak furniture is moisture-resistant, it can be still affected by mold. However, this can be easily taken care of – to get rid of mold, moss and mildew use cleaning products that are specially used for teak outdoor furniture care, or make your own homemade cleaning solution. One cup of washing powder, one cup of household bleach and 1/2 bucket of warm water are all you need. Apply this mixture to your furniture and leave it to stay that way for 5 minutes. If there are still signs of mold and mildew, repeat the procedure. Keep in mind not to leave the furniture with the bleach solution more than five minutes though. Spilling accidents are not uncommon at all. Juice, red wine and other drinks and foods can leave unappealing stains, which fortunately are easy to clean. Most of the time, warm water and soap will be enough to clean stains, especially if you clean them immediately. Keep in mind to never use chemical cleaners on a regular basis. Many of them include harsh chemicals that may damage the wood. Stick to mild soap and warm water and use chemical cleaners only if your furniture needs deeper cleaning. Use products that are recommended by the manufacturer. If the furniture is made from grade A teak, avoid using teak oil as it will destroy its natural protective oil. Instead, use teak sealant which will not cause any damage to the wood’s natural oil or its performance.